And yet, to condemn the 1603 Quarto for such reasons is to fall into a troubling short-circuit of logic. If the First Quarto came first, should not that be our standard for judging later versions–not the other way around? Or shouldn’t the later editions, at least, seem as susceptible to textual corruption as that first “bad” version? A chicken and egg mentality, when we think about Hamlet’s origins, starts to take a hold of us. Where, even, can we locate a true or original or authoritative version of Hamlet? Scholars have exerted great energies in working to resolve this last question. To attempt a solution, in this short a space, is to limit its manifold complexities; only to raise it is the point. Only two copies of the first quarto have survived since the pamphlet’s initial printing—a fact that may testify to its initial popularity, or perhaps just to the many contingent historical forces that pamphlets—as loosely bound sheets of flimsy paper—could succumb to. 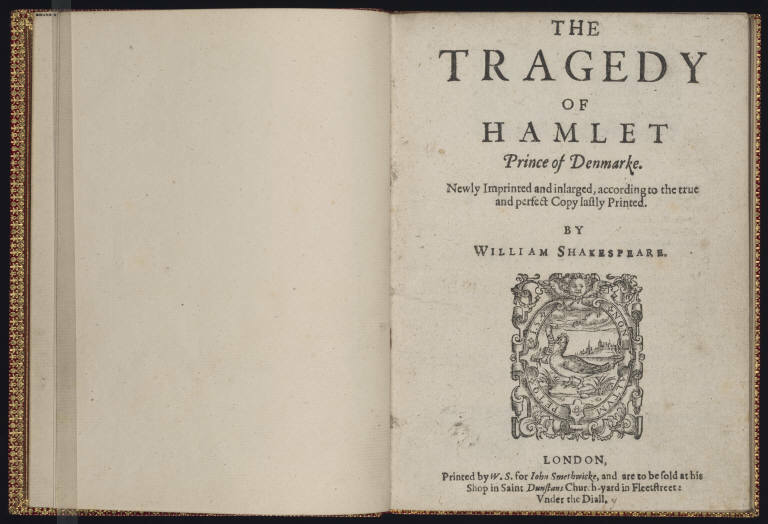 The many versions of Hamlet featured by Shakespeare at Yale, though—all printed in the wake of the bad quarto—depend like so many second or third or fourth editions upon the implicit presence of that first copy as part of their appeal. Though editing hands have changed the speech considerably, making it an interesting document to place in relation to earlier and alter versions of the play, certain textual features also make it an interesting document in and of itself. Notice, for instance, the punctuation, which had not yet been standardized. 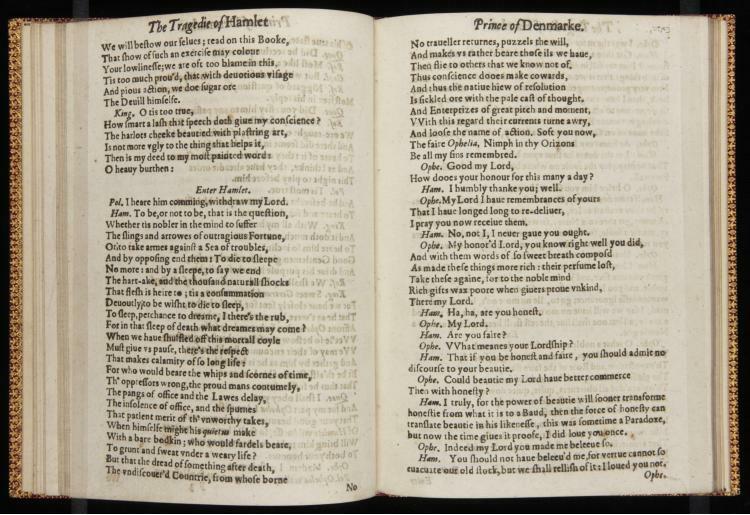 Notice, too, the implicit stage direction in Hamlet’s address to Ophelia; while the speech begins with “Enter Hamlet,” no similar such direction announces Ophelia’s appearance. It depends, instead, on Hamlet’s own language to act as a cue, implicitly rather than explicitly coaxing Ophelia onto the stage.